Hey Ken Mac! I could stand to be there...I'll bet you can find some great food. Another street name I've heard in movies or TV. Good eats there? Great colors and tones in this shot! Wonder if any of those places are any good. Great shot. I would love to try the Hummus Place! I bet they have good spaghetti and cannolis. Love the composition and angle of your image today. Excellent light, colors and the angle at which you've done this picture. ah one of those bright, sunny wintry days. gosh it was cold yesterday. Only going to get worse!! I suppose they will not sen across the Atlantic, so I'll have to drop by the next time I'm in NYC. It's all looking up Ken; a good place to hang out. Love this shot, the angle and the light are perfect!!! My preferred building's pictures, with fire escape. Love NY architecture through your eyes! Love the perspective on this, Ken. Altadena Hiker pointed me over here. 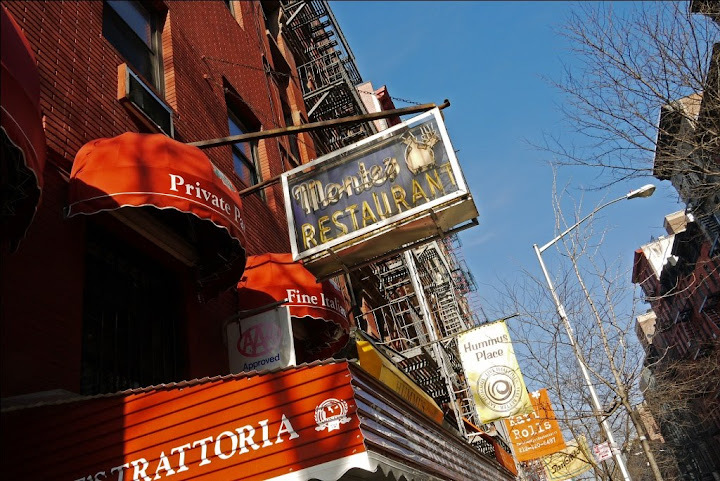 When I was a kid, every Christmas season we'd go into the city from Long Island and eat at Monte's. Another family with 8 kids would meet us there; we'd take up the whole restaurant. The food was excellent! After the great Italian feast we'd go see the tree at Rockefeller Center. I'm out in Southern California now but I always get nostalgic for NYC this time of year. Sorry to ramble on but this photo brings back great memories.